1) Stir together mango, lime juice, brown sugar, red pepper, garlic powder, cinnamon and allspice in a medium bowl; set aside. 2) Rinse chicken and pat dry. 3) Sprinkle on both sides with jerk seasoning and let stand for 10 minutes. 4) Cook on a well oiled grill over medium heat for about 5 to 7 minutes on each side, or until chicken is cooked through. 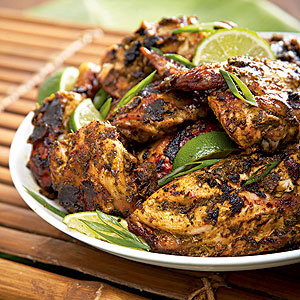 5) Remove from grill and squeeze lime halves over chicken. 6) Serve with mango topper.